We're excited to announce that we will be involved in this year's Sleep Event, which is described by the organisers as "Europe's favourite and leading event for interior hotel products". The Sleep Event will be held in the Business Design Centre in Islington on Wednesday 20th and Thursday 21st November and promises to be a rich mix of the very latest in furniture and products, with informative guest speakers and an inspirational installation that is the Sleep Hotel. Here six architects and designers have been tasked with creating a life size hotel room or bathroom which "invokes the spirit of the 60's". The winner will be announced at the show on Wednesday evening. 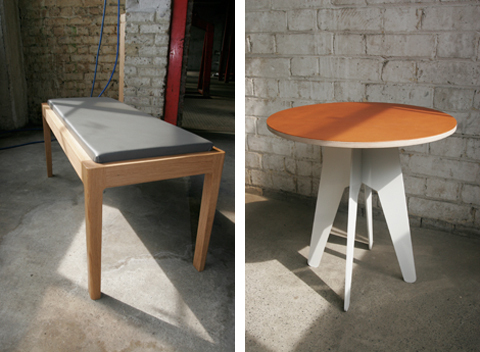 We recently showcased some new products at Designjunction 2013; The Hatton Range and the Hyde Bench. We are very pleased to say that we had a great response to them... so here they are in all their glory... 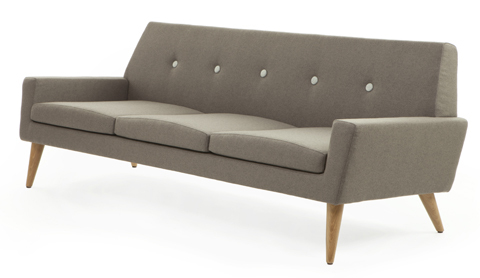 The Hatton Range features a fully upholstered arm chair and a two-seater sofa. The structured look of the chairs gives them a striking personality, whilst the combination of a timber frame, CMHR foam and wool upholstery makes these chairs a comfortable place to sit. The frameless Hyde Bench is equally as striking but in contrast this has been moulded using PU CMHR foam which makes it a comfortable light weight piece that also has the ability to stack away. Both the Hatton Range and Hyde Range come in single or two tone colour combinations to suit a wide range of environments. We're delighted to unveil our new Special Edition Hyde Stacking Stool, upholstered in a fabulous new digitally printed wool fabric from Bailey Hills. 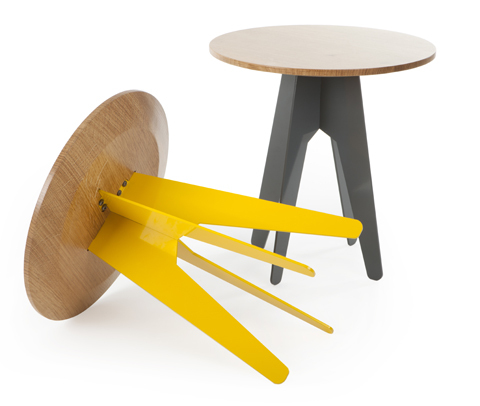 It's a new direction for our stacking stool and we're over the moon with the result... just can't wait now to show it at this year's Designjunction! Founded by the talented Jane Walker, Bailey Hills "explores the skilled craft of hand-screen printing, together with technological advances in digital printing, to produce quality, contemporary wool furnishing products." The wool is wonderful quality and the range of patterns that Bailey Hill designs are colourful, beautiful and exciting.... Don't forget you saw it here first!!! After many years of admiring and supporting the great work that Maggie's Cancer Caring charity do, I was honoured recently to have the opportunity to visit a Maggie’s Centre for myself. Maggie's Centres are based all over the country and are available for use by anyone who is affected by cancer. The objective of each centre is to provide "emotional, practical and social support to people with cancer and their families and friends". "Maggie's unique model of psychosocial support transforms the way that people live with cancer" and their vision is to provide access to " high quality, evidence based psychological, emotional and informational support" to everyone in the UK who is affected by cancer. Inspirational architecture is integral to the ethos of Maggie's Centres. Each Centre is designed by a different architect with the brief "to create a space that is both uplifting and protective, in which people can find the strength to live with hope and joy in the face of a cancer diagnosis". I visited the centre located atCharing Cross Hospital in West London and was imediately struck by the liveleness of this small bright orange building with its floating roof, its high quality architecture and the thoughful attention that's been given to the landscape around it. This building is immediately welcoming as you approach it up a winding path flanked with stone sculptures and wooden benches. Inside the building greets you with a domestic scale that creates an environment that is at once open and friendly. This particular centre was designed by Rogers Stirk Harbour + Partners, with gardens by Dan Pearson and was opened in 2008. I was grateful to see the great work that goes on within Maggie's and am keen to continue my support for them. 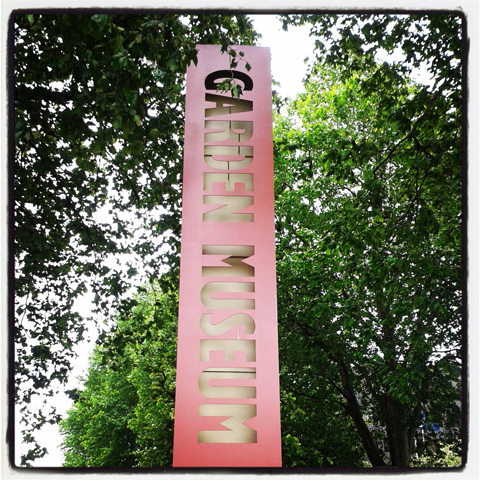 I was delighted to be invited to the Garden Museum recently by Maggie's Centres to hear a talk given by the inspirational fashion designer Sir Paul Smith, renowned landscape & garden designer Dan Pearson and award winning architect Stephanie MacDonald of 6a Architects. The evening focused on the connections between fashion design, garden design and architecture, their relationship to one another and the natural world around them. I attended the evening with Clive from Quarterre and we both left feeling very inspired... by the speakers as well as the Museum itself. Housed in a listed former church The Garden Museum was redeveloped by Dow Jones Architects in 2008 to incorporate a timber clad two-storey structure that wraps around the perimeter of the existing building, providing galleries for the permanent collection and temporary exhibitions. It's an impressive space. To the rear of the church there is a pretty 'Knot garden' which provides a quiet retreat in the heart of the city in which to enjoy coffee and cake from the Museum's cafe. All in all it was a great evening and a good introduction to an interesting museum that I know I shall return to soon... if you fancy a visit too it's located on the south bank of the Thames opposite The Palace of Westminster and Tate Britain. So we're two days into our three day stint in The Farmiloe Building in Clerkenwell and so far it's been a successful 4th event for Clerkenwell Design Week... It has been cold mind you... but the constant flow of people through 'The Shed' doors has kept us on our toes and given the show a vibrant, lively atmosphere. We're pleased to say that we've had a really positive response to our new Burgess Compact Tables and our Hyde Stools, we've met some lovely people and we've seen some wonderful furniture, products and lighting... so it's smiles all round for us! We're also delighted to be in such good company in The Shed: Another Country, Bark, Dare Studio, Deadgood, James UK, Jennifer Newman & Young & Norgate. Now open for business at No. 1 Fournier Street in Spitalfields, Percy & Reed East is the second hairdressing salon for Paul Percival & Adam Reed. The building, which started its life as a banana merchants, is located in a conservation area and has a Grade II Listing. It sits directly opposite the iconic Christ Church by Nicholas Hawksmoor and right next door to the 10 Bells pub (famed for its Jack the Ripper connections) so the place is steeped in history with plenty of character features and good old East End charm. Assemblyroom were approached to design a modern salon that would reflect the Percy & Reed brand whilst respecting the heritage and the listing of the building's interior. Working closely with Tower Hamlets & The Spitalfields Trust we were able to give the building a new lease of life, creating a light and spacious area for clients on the ground floor and a functional ancillary space for the staff in what was a disused and uninspiring basement. The scheme was designed so that the built in elements that provide the more functional roles (storage and shelving) would act as a minimal backdrop to the eclectic mix of furniture and accessories that dress the space. Cupboard fronts have been treated with Farrow & Ball painted tongue & groove doors in line with the original distressed vertical wall planking. Areas of exposed brick have been retained to emphase the original warehouse character of the space. Large mirrors give light to the rear of the space and Workhouse Collection floor tiles add a decorative feature to the backwash area. Had a very enjoyable evening out on Thursday night in Spitalfields at The Icon Awards 2012. This was an inaugural event and was one that should definately be repeated... the relaxed atmosphere was completey different to the other award evening formats - it was a standing event with drinks and canapes in Hawksmoor's elegant Christ Church. Great too to see such a diverse list of nominees; from Tokyo based Design Studio Nendo & London Product Design Studio Berg, to Internationally renowned architect Zaha Hadid & the Olympic Velodrome Building by Hopkins Architects. In the end though it was Barber & Osbergby, Thomas Heatherwick, O'Donnell + Tuomey and San Rocco who were amongst those who walked away with the top prize... Congratulations to everyone involved. We are keen to announce that Camira's new showroom is now open for business...Located at 13 - 16 Britton Street, just off Clerkenwell Road, the showroom is spread over two floors and provides a "new textile resource for interior specifiers and furniture manufacturers". There are over 700 fabrics to choose from in the showroom, making it not only a colourful and vibrant place to be but also an extremely useful resource when looking for that perfect upholstery material... Camira say "we've made colour king and grouped fabrics according to colour area to make selection easier for the specific scheme you’re working on". And as if that wasn't enough, we're delighted to say that two of our Finsbury sofas sit calmly within all of the colour, upholstered in Camira's Binary Plus... so if you are looking for a great range of fabrics or you'd like to view our sofa, please pop by and you'll recieve a warm welcome from Showroom Manager Amna Hassan. So we're in full swing at Designjunction and wow it really is the place to be... Now in it's second year Designjunction really has proved it's an integral part of the London Design Festival. This year's venue is an old Sorting Office from the 1960's which provides an industrial backdrop to some of the very best in modern furniture, lighting and textile design. The building is bursting with energy and plenty to see, from the more well known names of Conran, Hitch Mylius & Modus through to the emerging names of Bethan Gray, Dare Studio & Very Good & Proper... and we're delighted to be sharing floor space with them all. We're sited on the 2nd floor, where we're showing our brand new Hyde Stool alongside our firm favourites the Finsbury, Burgess and Long Eaton ranges. As well as three floors jammed full of design, there are pop up stores galore, some very cool restaurants (from Canteen & Fernandez and Wells) and even a cinema... the buzz about the place is tangible. We have just recieved some photographs from event organisers Innovision from this summer's British Business Embassy that was held at Lancaster House in The Mall. The BBE was a unique event that was hosted by UK Trade & Industry (UKTI) during the Olympic & Paralympic Games and we were delighted to be a part of it. During the BBE this prestigious Neo-Classical building had 18 of its rooms transformed to showcase modern art and design from both new and established British designers, photographers, furniture makers, and sculptors. We're proud to say that two of our Finsbury sofas upholstered in Camira Blazer featured in the State Dining Room amidst good company in the form of the Matador Chair by Terrance Conran and a Damien Hirst artwork. Other contributors to the event included: Paul Smith, Jasper Morrison, Barber & Osgerby, Ross Lovegrove, Ron Arad, Pearson Lloyd, Matthew Hilton Bethan Gray, Dare Studios, Thomas Heatherwick & Grayson Perry. 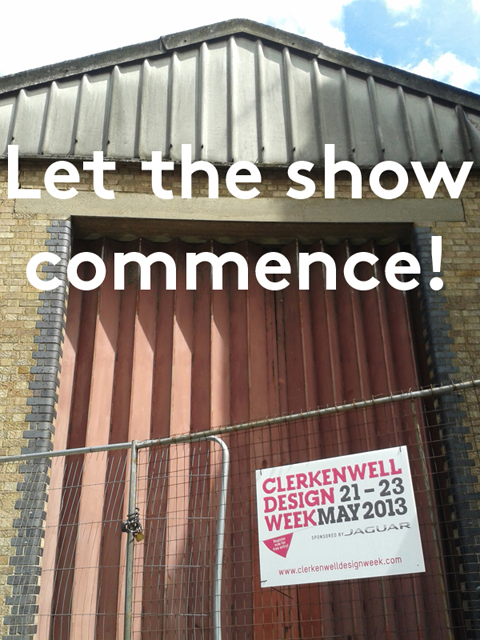 So we're finally getting back on track after our week out in Clerkenwell recently... we had a great show and we're keen to thank all those people who made this year's event such a great success. The sunshine came out for us, the Farmiloe building was brimming with vistors and there was a real buzz in the air in and around the Clerkenwell area. We are delighted to say that our A x a collaboration pieces with the menswear brand Albam were very well recieved. 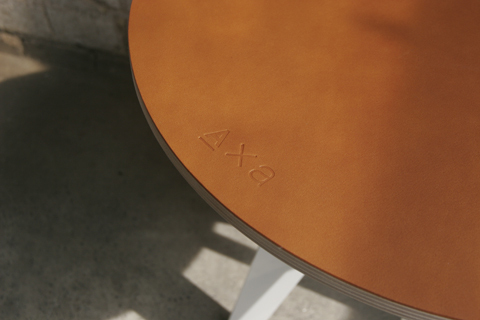 We showed two pieces which were finished with Albam's signature leather detailing: the Burgess table with a tan leather table top and the Long Eaton bench with a grey leather seat pad. Also, we've finally set up a Facebook page... we'd love to see you there too! The Ideal Home Show, at Earls Court throws open it's doors today and we're pleased to say that we have one of our Finsbury Arm Chairs on the British Wool Organisation's stand. 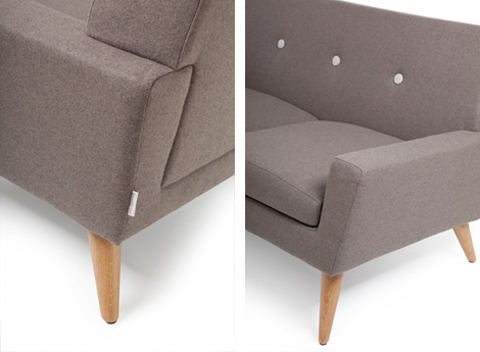 The Finsbury chair has been upholstered in Camira's Craggan fabric to support the Campaign For Wool and we're really pleased with the results. It's also great to be amongst such good company on the stand: Ardalanish Weavers, Axminster Carpets, Camira Fabrics, Fairbank Textiles, Inspired Rugs, John Lewis, Stuart Clayton,& Thermafleece. If you get an opportuntiy to visit the show, please pop by and have a look. The home of Assemblyroom is in Crystal Palace, South East London... an eceltic and interesting neighbourhood with a really strong sense of community. Named after Joseph Paxton's glass masterpiece that was built to house The Great Exhibition of 1851, The Crystal Palace sadly burnt down in 1936 and now all that remains are the grand staircases, the terraces and the sphinxes standing guard at the entrance to what must have been a truely awesome building. The grounds of The Crystal Palace still exist as a public park today with lakes, ornamental gardens, and most impressively of all 33 life size concrete dinosaurs by Benjamin Waterhouse Hawkins... always a joy to walk around, they never fail to delight! The hub of Crystal Palace is equally interesting... centered round 3 streets known locally as The Triangle it's layout gives the shopping area a village like feel rather than the more standard one road , one high street approach. Couple this with the abundance of independent shops, cafes and restaurants in the area and it makes for a great place to live and work! A concrete block counter displaying all manner of tasty things to eat runs along the length of this rustic yet minimal interior. A buzzing little cafe with a cosy intimate feel... so cosy in fact it's not always possible to get a seat! Home was showing alongside it's sister show Top drawer in the next door hall... and from our point of view it was definitely an Earls Court of two halves. Home was calm, considered, well laid out with room to breath... whereas Top Drawer was a full on attack on the senses!